This weekend Circuit of the Americas management will be hoping that things go smoothly, after extensive work was carried out to try and reduce bumps in the surface of the track. For Michelin this does present some potential challenges, as they have no data that they can accurately rely on when selecting their tyre allocation for MotoGP Round 3. The 5,513m long track is characterised by the long start-finish straight, which sees riders climb more than 40 metres by the time they reach Turn One. 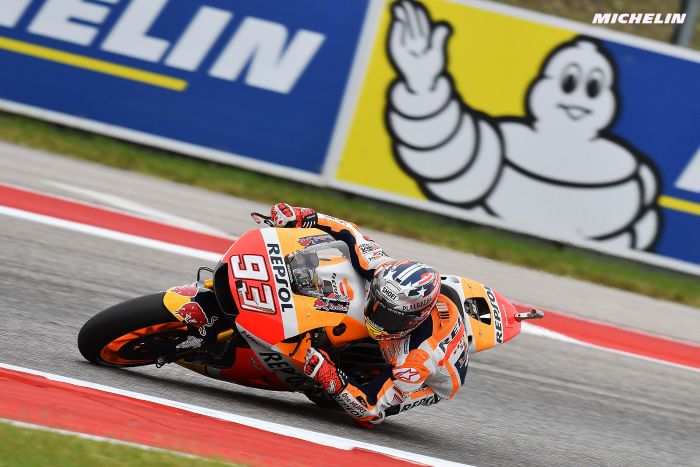 Reigning champion Marc Marquez, who won in Texas in 2019#8, currently holds the all time lap record, along with the race lap and race duration records, and few people will bet against him this weekend in the USA. Michelin have made the decision to bring all-asymmetric rear tyres to Austin, with a harder rubber compound on the right hand shoulder to deal with the high stresses placed on that side of the tyre from Turn 16 through to Turn 18. “Austin is a very demanding circuit for all involved and this year it feels like we are going there again not quite sure what to expect. The track has had some more repair work to try to smooth out the bumps, so it will be a case for all to see how it performs, and how the asphalt works compared to other seasons. We have a strong line-up of compounds, which we think are ideally suited to what we expect from the track and will give the opportunity to push for some very strong performances and fast times, but until Friday morning we don’t completely know how the circuit will behave.